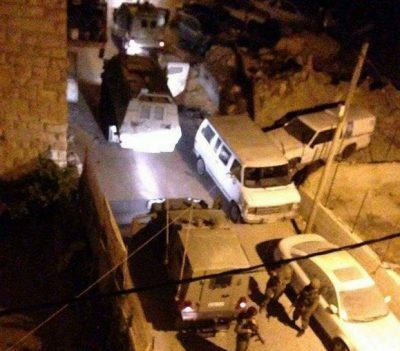 Dozens of Israeli soldiers invaded, on Monday at dawn, the West Bank city of Bethlehem, al-Khader and Teqoua’ towns, south and east of the city, searched homes and abducted two Palestinians, in addition to summing a child, only ten years of age, for interrogation. The soldiers also invaded ‘Azzoun town, east of the northern West Bank city of Qalqilia, and searched many homes, after forcing the families out in the cold. The Bethlehem office of the Palestinian Prisoners’ Society (PPS) has reported that the soldiers abducted a former political prisoner, identified as Mohammad Adeeb Mousa, in his thirties, after invading and searching his home, and confiscated his Taxi. The soldiers also invaded the home of Ahmad Hasan Salah, and searched the property, before summoning his child, Ahmad, only ten years of age, for interrogation in Etzion military base and security center, south of Bethlehem. In addition, the soldiers abducted Faisal Yousef Sha’er, 17, from his home in Teqoua’ town, east of Bethlehem, after breaking into his family’s home and violently searching it. The soldiers also invaded ‘Azzoun town, east of the northern West Bank city of Qalqilia, before breaking into and ransacking dozens of homes, especially in the eastern area, near the Annexation Wall, and downtown area. Media sources in Qalqilia said the soldiers removed entire families out of their homes, and forced them to wait in the cold, and under the rain, while searching their properties; the families had to wait for about two hours. Although the soldiers withdrew from the town, they installed a roadblock at its northern entrance, and started stopping and searching dozens of cars, while interrogating scores of residents and examining their ID cards.